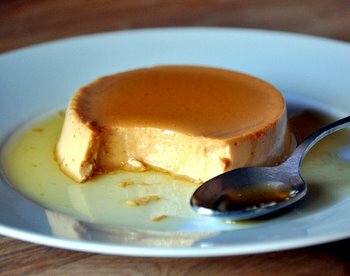 Creme caramel has a bit of a bad reputation as being difficult to make, but this is one myth that should be busted because it is nowhere near as difficult as it looks. Actually, you might want to keep the myth going just so you can impress dinner guests by bringing out perfectly molded creme caramels for dessert at the end of a meal! 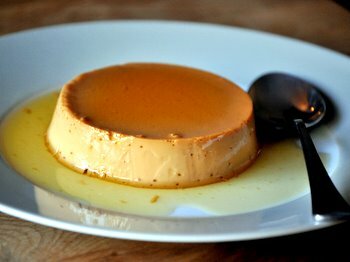 Creme caramel is also known as flan. It is a baked custard that features a dark, caramel syrup on top of it when it is served. This is a Dulce de Leche Creme Caramel. The custard is made with a combination of dulce de leche, milk, eggs and egg yolks. It actually gets all of its sweetness and flavoring from the dulce de leche, which you can make yourself or buy at most markets. The custard is poured on top of ramekins that have been coated with a layer of deep amber caramel. The whole dessert is baked in a water bath and cooled before serving. The caramel turns from a solid candy to a syrupy topping before the desserts are ready to serve. It is rich, creamy and has a great caramel flavor both from the syrup topping and from the caramel-flavored dulce de leche. I like to make creme caramel in individual ramekins because it makes them very easy to serve (and easy to serve to yourself if you only want to eat one at a time!). I used 6 ounce ramekins for this recipe, but the recipe can be doubled if you want to make more servings or use larger ramekins. If you are going to use smaller 4 ounce ramekins, you will want to check the custards early to make sure that they don’t overbake in the oven. In a small saucepan combine sugar and water. Bring sugar to a boil and cook over medium heat until sugar turns a deep amber color, about 7-10 minutes. Divide into four 6-ounce ramekins, coating the bottom of each. Set ramekins aside. In a medium saucepan, combine milk, dulce de leche and salt. Cook over medium heat, whisking occasionally, until the mixture is smooth and just comes to a simmer. While the milk comes to a simmer, lightly whisk the eggs and egg yolks in a medium bowl. When the milk reaches a simmer, remove it from heat and temper the eggs by very slowly streaming the milk into the eggs while whisking constantly. 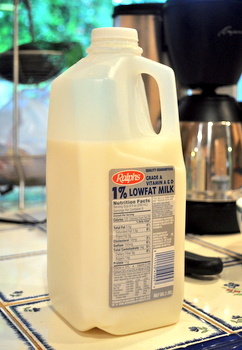 Add the hot milk a few tablespoons at a time to ensure that you don’t curdle the mixture. Whisk in vanilla extract, then strain mixture into a large measuring cup or bowl with a pouring spout. Arrange ramekins in a 9×13-inch baking dish. Divide custard mixture evenly into the ramekins. Place baking dish in oven and pour hot water into it until the water reaches approximately halfway up the sides of the ramekins. Bake custards for 25-30 minutes, until just set. Remove from water bath and cool to room temperature. Refrigerate for 4 hours, or overnight. To serve, run a sharp knife around the sides of each ramekin and invert onto a serving plate or bowl. ooo yum! Luckly I have a bit of sweetend condensed milk to use, I’m going to make this! Here in Argentina, flan is usually served with dulce de leche or whipped cream. It’s also a very common dessert. Pretty much every restaurant offers it. And that’s AWESOME. I love DULCE DE LECHE!! !…I feel lucky to be Argentinian and find this lovely product everywere. Wonderfull recipe. IÂ´ll add to Eugenia coment that itÂ´s also a very common family dessert, and may be a confort food for a lot of argentinians. That got my heart racing just looking at it! Must…make…. Oh, these look so good! I love eating things like this, so I know that I will love this recipe. Thanks for posting. Is the dulce de leche pre-made? As in bought? You can’t find it pre-made here so you need to make it yourself as in boiling a jar of sweetened condensed milk. I’m just wondering about concistency, fudgy or saucy? I tend to boil the cans for hours which creates a thick sticky fudgy kind of dulce de leche. An argentinian commentator on my blog suggested only an hour or so for a more saucy consistency. Here IÂ´m again. There are two types of Dulce de Leche. TheÂ´s the classic one, calles just like that “clasico” or it has simply no name, just Dulce de Leche. Or we can use Dulce de Leche “REPOSTERO”, which is mostly used as filling (it goes great with a chocolate or coconut cake). So for this recipe will be fine using the classic one (this will be every dulce de leche that doensÂ´t have mention the word REPOSTERO in the jar. There are many brands of Dulce de Leche, I can recomend SANCOR, LA SERENISIMA, LA SALAMANCA.